A guest blog by Al Nagler. Over the years, I’ve heard many interesting stories on the origin of the Nagler eyepiece, especially on Internet forums, so I thought I'd set down what I've discussed at many convention talks worldwide — while I still retain some memory faculty! I grew up in the Bronx. When I was 12, my father took me to the Hayden Planetarium, unleashing my enthusiasm for the magnificent universe we're so lucky to share. 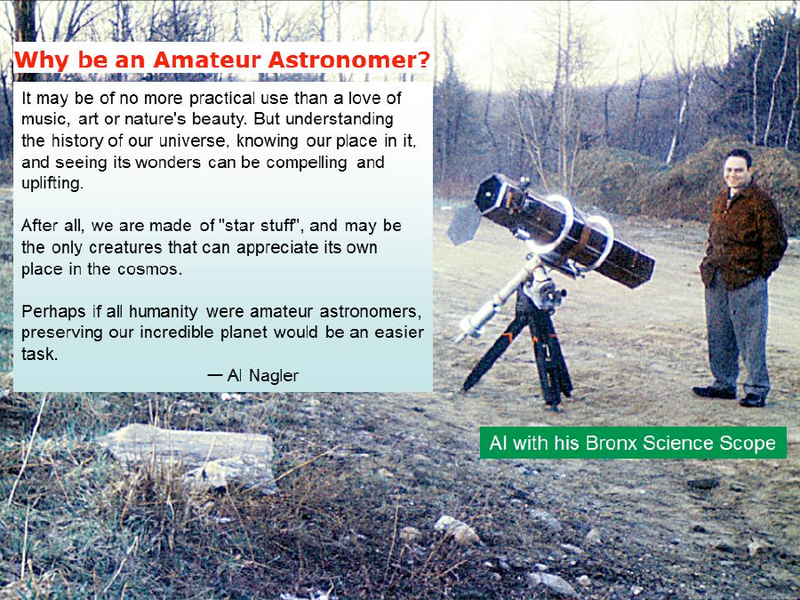 My 3.5-inch Skyscope reflector drove me to want more, so I went to the Bronx High School of Science, where the shop program allowed students to pursue any worthwhile project. There, I built an 8-inch f/6 Newtonian reflector of my own design, learning drafting, machining, woodworking, and mirror making over a year-long effort, and winning the shop award at graduation. This led to an opportunity to write an article on the project for Mechanix Illustrated, which was published in the December 1955 issue. 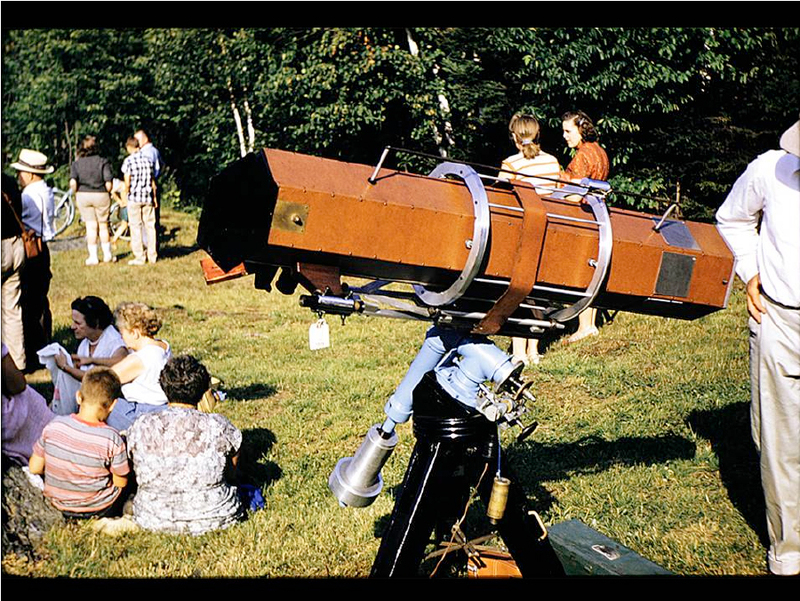 The scope also won a 3rd-place prize for mechanical excellence at the 1958 Stellafane telescope-makers convention in Vermont. Because I knew that Earle Brown, the Sky and Telescope editor of the "Gleanings for ATMs" column, was also chief project engineer at Farrand Optical, a Bronx firm doing research and development for military and commercial projects, I used the magazine article as an entree to get a drafting position in 1957, and later joined the optical design department headed by Martin Shenker, another Bronx Science grad. The simulator Nagler designed served all the Apollo astronauts. Wouldn't it be nice if I could someday have a “spacewalk” eyepiece for my telescope, I pondered? I got goosebumps as I watched the lunar landscape flying through the simulator view. By 1971, Farrand asked me to design a 140° optical probe (a fancy TV camera) for a Wright-Patterson Air Force Base aircraft simulator. 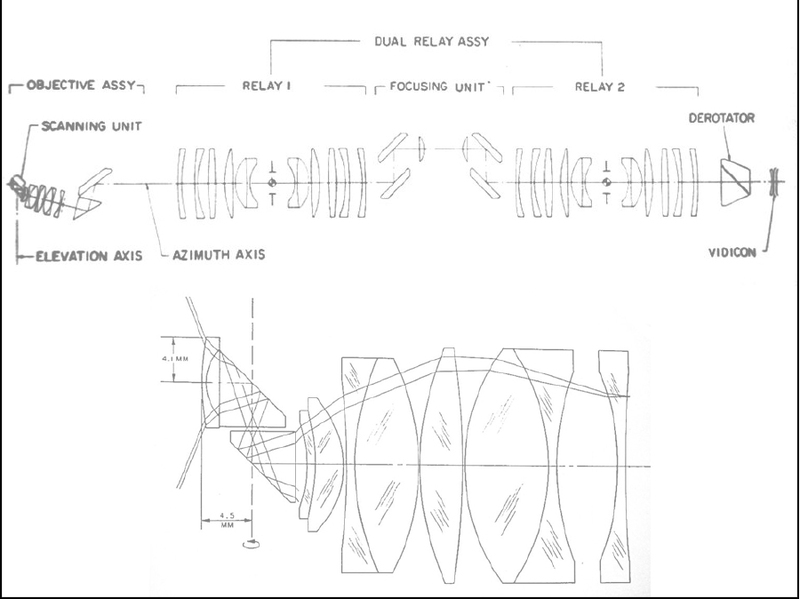 The 45-element design used tilting relay lenses to image a model landing strip in focus while “flying” down to ¼" above the model at “touchdown.” The camera had a small objective lens with an external exit pupil where sapphire prisms created pitch and yaw simulations. 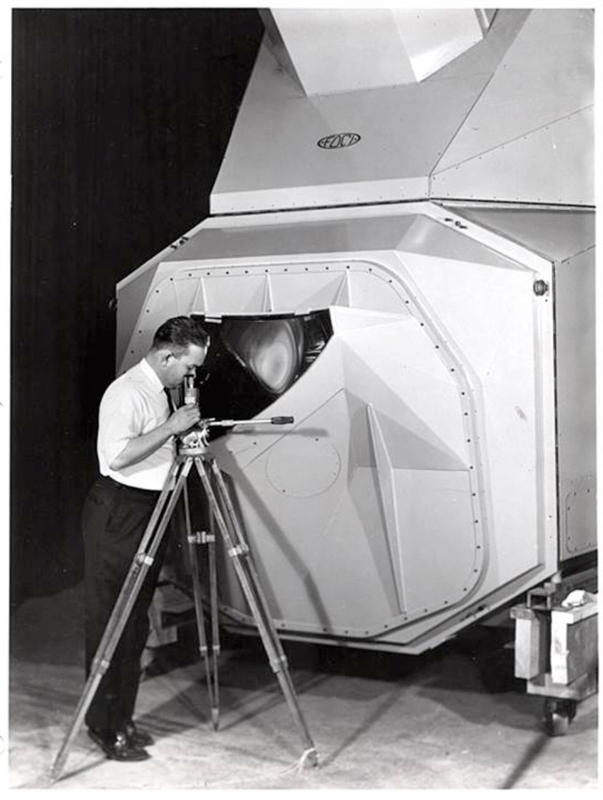 The optical probe that Al designed for an aircraft simulator pointed him to the "Nagler" concept. Going to the City College of New York at night allowed me to earn a physics degree by 1969, which gave me the credibility to become Chief Optical Engineer at Keystone Camera in Clifton, New Jersey in 1973. My camera lens design work sent me to Japan to help with production and opened the door to a relationship with a lens manufacturer (another lucky star). In 1977, my wife, Judi, and I started Tele Vue to design and produce lenses for projecting small television set pictures onto big screens. We named the company to plan for possible future astronomy equipment developments. While she managed it during the day, I joined a dear Farrand friend, Matt Baum, in starting a company making industrial motor controls. For 20 years, this was my daytime financial mainstay so I could support my nighttime venture. This diagram compares Tele Vue’s Plössl eyepiece design with the Nagler. Quite a difference! By 1979, I decided to look in earnest at developing a well-corrected “ultra-wide field” eyepiece. 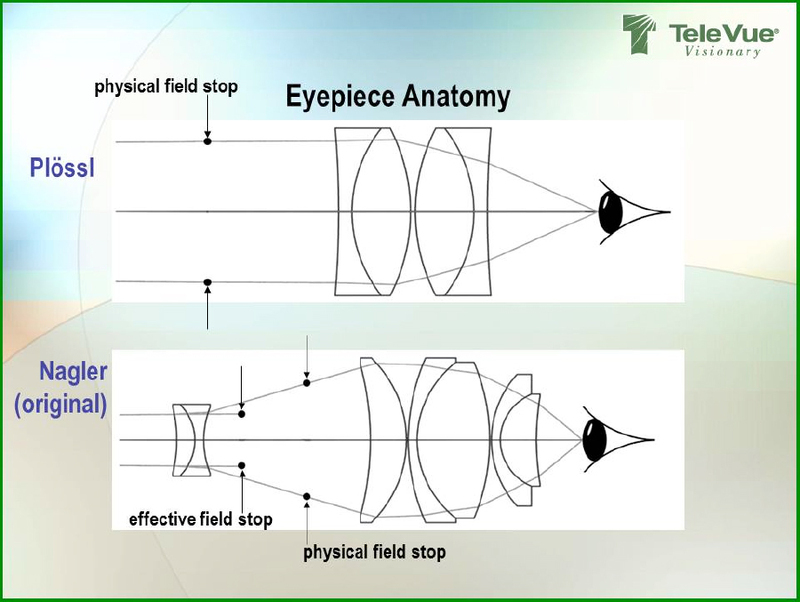 Recalling my 1971 optical probe objective, which utilized a negative lens near the focal surface for field correction, I realized the objective, in reverse, could be the principle behind such an eyepiece. Working nights and weekends by renting time at a computer service company in Connecticut, I designed the Nagler eyepiece. I knew of nothing like the Nagler design from optical textbooks or products on the market, so I applied for a patent. My patent attorney advised me that it would be a waste of time and money to pay for any research of existing prior work because the patent examiner’s “due diligence” would uncover any relevant historical examples. Indeed, some references were found during the patent process and mentioned in the patent I was awarded for the “Ultrawide Angle Flat Field Eyepiece.” These references in the patent erroneously led naysayers to speculate that my design was not original, but rather based on work of others. After prototyping my 90° design, I cut the field to 82° because the pupil aberrations became too apparent in the 90° model. While the Nagler was the first eyepiece I designed for Tele Vue, I feared entering the astronomy market as an unknown “kitchen-table” company with such an expensive eyepiece. This caution led me to produce a Plössl eyepiece first, to gain reputation, experience, and capital. Knowing the edge field limitations of my highly regarded Clavé Plössls, I improved the edge correction in my design of 1980. It was extremely well received. “Sharpest I’ve Ever Used” headlined Richard Berry's Astronomy magazine review. Again, I thank my lucky stars that the Plössl introduction allowed us to advertise, engage a dealer network, and develop a reputation that could predict the likely success of the Nagler. This flow chart shows the company’s early product evolution. In order to ensure quality control of every eyepiece sold, and to critically evaluate performance relative to design goals, I developed and patented the Multi-Purpose Telescope. This was a 5-inch f/4 Petzval design with a fully corrected flat field and a built-in iris diaphragm. With it, I could check eyepieces at f/4 for image performance and at any setting down to f/16 for discovering internal dirt, chips or scratches. With 100 percent inspection of every eyepiece we ever made, this scope is still in use today. While not covered here, this first production Tele Vue scope evolved over 25 years and through several iterations into today’s NP-101is and NP-127is apochromatic refractors. The original Nagler series, now often referred to as “Type-1,” began with the 13mm focal length, followed by 9mm, 4.8mm, 7mm, and 11mm models, with the 13mm, 11mm, and 9mm having convenient dual 2" and 1¼" barrels. Since the series is a scaled design, size, weight, and eye relief scale down uniformly. 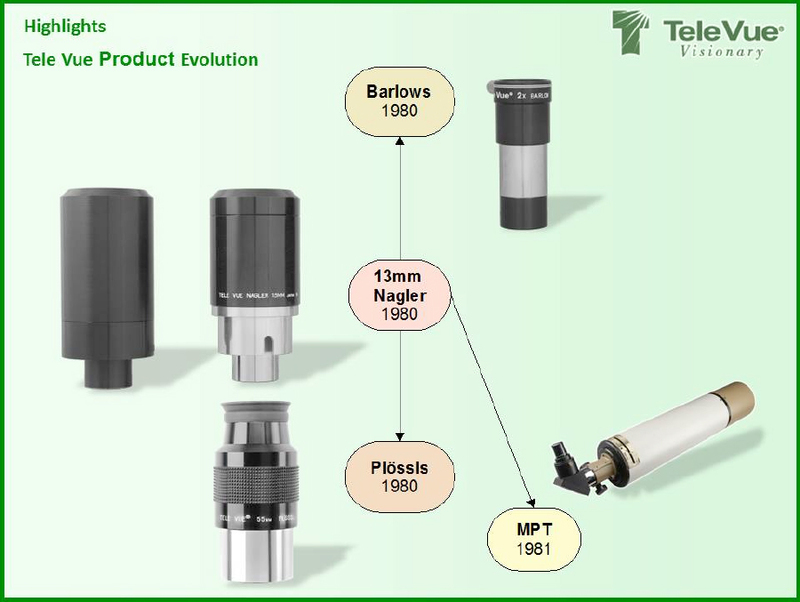 The Plössls are also scaled designs, with focal lengths of 55mm (2" barrel), 40mm, 32mm, 26mm, 21mm, 17mm, 13mm, 10.4mm, and 7.4mm for the earliest versions, with 25mm, 20mm, 15mm, 11mm, and 8mm replacing the earlier similar models in 1995. The 55mm, 40mm, and 32mm have the maximum true fields in their barrel sizes, with 32mm and shorter models being parfocal with each other and the 7mm and 4.8mm Naglers. To add flexibility and power increases, I designed the 1.8x (1¼"), 2.5x (1¼"), and 2x Big Barlow (2"), which we sold from 1980 to 1989, and in 1995, superseded the 1.8x and 2.5x with 2x and 3x versions. In 1982, I felt it would be valuable to bridge the apparent fields of 82° Naglers and 50° Plössls with a line of 65° Wide Fields that would be sharper to the edge of the field than the popular Erfles of that time. Also a scaled design series, it included 2", 40mm and 32mm models with 2" barrels and parfocal 24mm, 19mm, and 15mm models with 1¼" barrels. By 1986, we released a new line of Naglers with several unique properties. The Nagler Type 2 series essentially eliminated the pupil aberrations of the original 13mm Nagler, their longer focal lengths offered larger true fields of view, and they were the first non-scaled series we developed. This meant each eyepiece was a unique design. It allowed each focal length to have 12 millimeters of eye relief, a value based on the positive acceptance of the comfortable 12mm eye relief of the original 9mm Nagler. The 20mm Type 2, in a 2" barrel, was now the Nagler with the largest true field. The 16mm and 12mm were lighter models and had the convenient dual 2" and 1¼" barrels. This flow chart shows how the Paracorr led to upgrading Wide Field eyepieces to Panoptics, and how the Barlow interface lead to Powermates. With the edge sharpness of Tele Vue eyepieces, I became increasingly unhappy with the edge performance of the 12-inch f/5.3 Newtonian reflector I built in the 1960s. Our highly corrected eyepieces revealed the fast mirror’s coma, which turned stars at the edge of the field into “comets.” So in 1989, I developed the Paracorr (Parabola Corrector). This made fast mirrors (such as f/4.5), with their larger true fields, perform much like our flat-field, coma-free Petzval refractors. This extended our concept of larger corrected fields to a new breed of compact Dobsonian reflectors. To make the Paracorr a “drop-in” device, rather than needing to build it into a focuser, I incorporated a slight 1.15x Barlow lens effect to move the focus of the telescope out. This effectively reduces the amount of in-travel needed when adding the mechanical path length of the Paracorr. Well, the Paracorr exemplifies this law for me. When I put one of our long-focal-length Wide Field eyepieces in my Paracorr-equipped Newtonian (eliminating the coma), I was dismayed that the small residual astigmatism in the eyepiece design was now revealed. Star images at the edge of the field looked like tiny crosses! So, I went back to the drawing board to design a replacement for the Wide Fields. I came up with the Panoptic (panoramic optic), which was not only sharper at the 68° field edge but showed less pincushion distortion, too. First introduced in 1992 as a scaled design with the 35mm model having a 2" barrel and the 22mm with a dual barrel, another unintended consequence required a new product: the Panoptic Barlow Interface Lens (the worst product name I ever came up with). Using the 35mm Panoptic with our 2" Big Barlow, the diverging field rays exiting the Barlow introduced vignetting and some image degradation by extending the eyepiece’s eye relief. The positive doublet interface I inserted between the Barlow and the 35mm Panoptic brought the field rays back to parallel and solved the problem. By 1998, I designed a system that integrated a Barlow lens with the interface lens into a new product type as a general solution to the issue. I first introduced the Powermate with 2.5x and 5x 1¼" models. Another advantage with this nearly parfocal series is that with almost constant magnification that is independent of back focus, they are great matches for Hydrogen-alpha solar viewing filters. In 1999, we added a 4x, 2" model. The line was completed with a 2x, 2" Powermate in 2002, and special T-ring adapters were also introduced so all models could be used for imaging applications. In 1994, we brought out scaled 27mm (2" barrel) and 15mm (1¼" barrel) Panoptic designs, with the19mm introduced two years later. Desiring Nagler lines for more eye relief for eyeglass wearers, planetary magnifications with short-focal-length scopes, and expanded true fields resulted in the Type 4, 5, and 6 series beginning in 1998. This development work also led to the lighter, smaller, long-eye-relief Radian series, which I based on Nagler principles. The Type 4, 22mm, 17mm, and 12mm eyepieces all had unique, non-scaled designs with eye relief of approximately 18mm. A click-stop adjustable eyeguard made them equally desirable for use with or without eyeglasses. With newer coatings and virtually no pincushion distortion, they were natural successors to the Type 1 and Type 2 models. As mentioned, 1998 also brought the compact Radians with 60° fields, 20mm eye-relief, click-stop eyeguards, distortion-free fields of view, and parfocal models. They were highly praised for planetary viewing in focal lengths of 18mm, 14mm, 12m, 10mm, 8mm, 6mm, 5mm, 4mm, and 3mm. 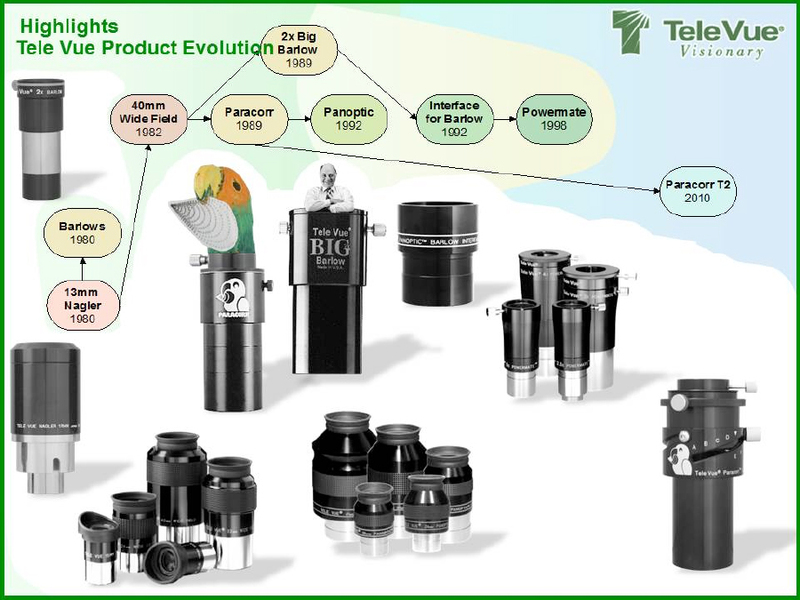 In 1999, we introduced the scaled Type 5 series with focal lengths starting with the celebrated 31mm, the largest true field Nagler for 2" focusers. This was followed by the 16mm, with the largest true field Nagler in a 1¼" format. 26mm and 20mm models rounded out the Type 5 series. The year 2001 witnessed the compact individually designed Type 6 series, all with a desirable 12mm eye-relief. Focal lengths first introduced were 13mm, 9mm, 7mm, and 5mm, followed by 11mm, 3.5mm, and 2.5mm to complete this parfocal series. Also, from 2001 to 2003, to meet the desires of planetary observers for simpler designs, we developed the 5-element 3–6mm and 2–4mm Nagler Zooms. Because zoom camera lenses are widely regarded as inferior to their fixed focal length equivalents and despite my name being normally associated with an 82° apparent field of view, I elected to use the Nagler name for these 50° models. I felt my reputation applied here was important to overcome the zoom stigma. Besides full-field performance in even fast scopes, which Orthoscopic and Plössl designs can’t match, these zooms are parfocal, with constant 50° apparent fields and 10mm eye relief at every setting, even 2mm! Equally important, the click-stop settings and power range permit instantly adjustable magnifications to mitigate atmospheric turbulence limits — a unique capability for obtaining real-time maximum planetary detail. 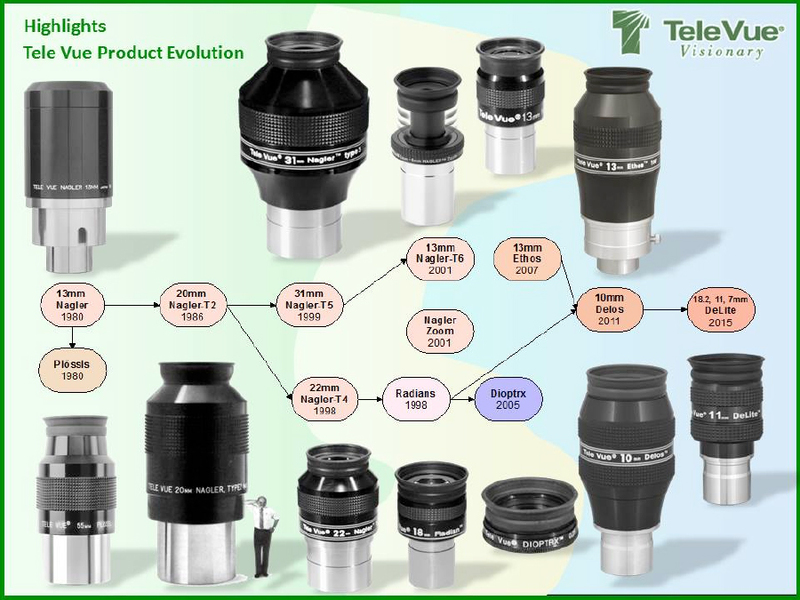 This illustration charts the path from Nagler series designs to Ethos, Delos, and DeLite series eyepieces. Paul Dellechiaie has worked at Tele Vue in many capacities since 1985. It was clear by 2002 that his technical capacities and telescope making experience made him an ideal candidate to learn optical design and become my right hand in developing new products. He honed his capabilities first on selected products to add to our lines in 2002 with the 2x Powermate and 24mm Panoptic eyepiece. The 24mm Panoptic was to replace the dual-barrel 22mm model with a maximum true field version for 1¼" focusers. It is also an alternative to the 32mm Plössl. Its improved performance has received wide acclaim, especially for binocular viewers. In 2003, Dellechiaie’s 41mm scaled version of the 24mm achieved the maximum true field for 2" eyepieces, equal to that of the 55mm Plössl. By 2005, my eyesight astigmatism reached 1¾ diopters, and I became increasingly frustrated using eyeglasses, so I embarked on a project to develop a universal solution to replace eyeglasses: the Dioptrx lens. The Dioptrx lenses have from ¼ up to 3½ diopters of astigmatism ground into them. Housed in a simple cell that replaces the original rubber eyeguard from our long-eye-relief eyepieces, the Dioptrx sits over the eye lens and can be rotated to correct your exact prescription including angle adjustment. Made from quality, polished optical glass and using advanced multicoatings Dioptrx stays true to my “do no harm” philosophy. If you see me at a convention, I can test you with a real demonstration. Customer reports and magazine reviews transformed my eyesight frustration into a market success. While I had been concentrating on developing the “Imaging System” telescopes and accessories, my son David, who started full-time with Tele Vue in 1988, and is now company president, suggested a groundbreaking project to Dellechiaie while I was away on a vacation in early 2006: to reprise the Nagler revolution by developing a 100° apparent field of view eyepiece with major advancements in distortion and other aberration correction, color neutrality, contrast enhancement, and long eye-relief. He wanted it to be an all-around, “no-excuses” performer and suggested some direction for Dellechiaie to explore in creating such a design. Their plot was to keep the project a secret from me until there was a preliminary design that looked to satisfy the project goals. It worked, and David named it “Ethos,” reflecting positive attributes that Tele Vue stands for: image purity using every technical advancement available, exceptional build quality, and business and marketing integrity. And we chose 13mm as the first focal length in homage to and for direct comparison to its forbearer. The 13mm Ethos appeared in 2007, and I had the pleasure of introducing it to fellow amateurs at conventions around the country. I heard so many “wows” that it inspired me to find a technical explanation for “WOW.” See my essay on our website titled “The Majesty Factor” — a factually correct explanation sometimes reviled by “Internet experts” as a marketing gimmick. Well, boys gotta have fun, and I certainly did. By 2008, we expanded the line to add 6mm, 8mm, and 17mm models; 2010 witnessed 10mm and 21mm focal lengths; and 2010 and 2011 saw special versions, the 3.7 and 4.7mm models. In evaluating these designs, it was clear to me that we could expand the apparent fields from 100° to 110°, the very same field I designed more than 40 years earlier in the lunar module simulator, which inspired my “spacewalk” eyepiece quest. So, I asked Paul to push a little harder. Look at the Moon through these eyepieces, and you may get the same goosebumps I got as the majestic lunar landscape flew past me in the simulator's triangular window (hence, 110° SX, for Simulator eXperience). In 2009, when I saw that Mike Lockwood had made a 20-inch f/3 no-ladder Dobsonian reflector, we asked Dellechiaie to develop a more advanced Paracorr to accommodate our wide eyepiece line. The Paracorr Type-2 that he developed makes an f/3 system perform like one at f/12 (with respect to image quality). Al Nagler is an optician, to be sure. But he’s also a dedicated visual observer who still relishes a dark night sky. By 2010, because of dramatic price increases in the rare-earth element lanthanum that China supplies to glass manufacturers outside of China, it became clear that our heavily lanthanum-glassed Radian line was not practical to reorder. This raised the question: Could we make a better version based on our Ethos success, using other glass options, and at competitive pricing? The answer was “Delos” with 72° apparent field, 20mm eye relief eyepieces with all of the performance attributes of the Ethos line. These unique, non-scaled designs of 17.3mm, 14mm, 12mm, 10mm, 8mm, 6mm, 4.5mm, and 3.5mm focal lengths are relatively compact models and binoviewer friendly. Each features a sliding locking eyeguard housing that accepts Dioptrx. I chose “Delos” for a name because that’s the island where Apollo, the Roman god of light, was born. And it gives recognition to Paul Dellechiaie, who is also currently designing the DeLite series. The DeLite is an even more compact and economical eyepiece with a 62° apparent field and a similar eyeguard locking mechanism. It was introduced in focal lengths of 18.2mm, 11mm, and 7mm at the Northeast Astronomy Forum in 2015. The name DeLite generated a lot of discussion here at Tele Vue, but it credits Dellechiaie in the name and nods to being a lightweight Delos. Even the detractors of the name admitted it was a delight to look through. Follow our progress at TeleVue.com, see us at conventions and star parties, or call Tele Vue at 845-469-4551 for advice from our knowledgeable staff of fellow amateur enthusiasts. Like them, I also enjoy talking with fellow amateurs.